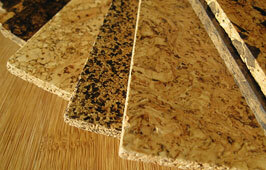 Cork flooring is quick and easy to install. You can choose either a floating floor, which is not glued or nailed to the subfloor, or cork tiles, which are glued down to the subfloor. 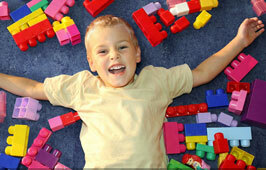 Floating floors are made to click and lock together for a quick and easy, no-mess installation. Adhered tiles are secured in place with an adhesive. Typically, the shape of the subfloor is the deciding factor between a floating floor and glue down cork tiles. If the subfloor is cracked and in poor condition, or if it is unlevel, has old vinyl tiles or sheeting, or is grimy or dirty, then floating floors are recommended. The use of a floating floor over poor subfloors avoids costly subfloor repairs, as long as the floor is reasonably level. In addition, if there is any risk of moisture migration from a concrete slab, we recommend installing a moisture barrier before installing your floating floor. Adhered cork tiles can be used over wood or concrete subfloors, which are dry, clean and free of dirt, grease, wax or anything that would hinder a good bond. Make sure any subfloor cracks have been properly filled. Rather than being nailed or glued to a concrete or plywood subfloor, floating floors sit on top of your subfloor. This type of flooring typically takes less time to put in and can be installed over slight inconsistencies in your subfloor. Glue down cork tiles need more time to install, due to the use of adhesive, and require a smooth subfloor or inconsistencies will be visible. Both flooring options are great choices, but your subfloor condition and your timeline will determine the flooring that best suits your project. 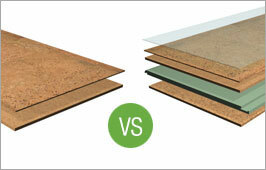 Below is a comparison of the two types of flooring to choose from. Can be installed over radiant heat, but the surface must not exceed a temperature of 82 degrees. Floating floors can be installed over wood, laminates, vinyl and tiles with small grout joins. Can be installed in bathrooms, but requires an additional coat of polyurethane. Must leave expansion gap around perimeter of the room. Floating floor construction is more comfortable under foot since it does not have to be baked to create a rigid form like adhered tiles. Instead, the rigidity of floating floors comes from the HDF locking system, which allows it to retain its natural cushioning quality. Subfloor should be even and should not have any high or low points. Height differences between two subfloors requires flashing or leveling compound. Less expansion and contraction than floating floors. 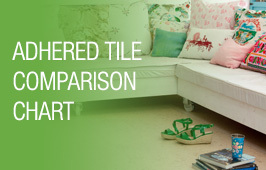 Tiles are 12”x12” and can be installed in different patterns, thus offering more design possibilities. Very eco-friendly product since it is comprised of 100% cork. Only the Terracotta tile is recommended over radiant heat, due to the fact that it is double-baked to achieve a darker appearance and can withstand being placed over radiant heat.